Exactly 10 days from now, climate negotiators from all round the world will meet in Lima, Peru for the 20th session of the annual UN climate conference (UNFCCC COP20/CMP10). 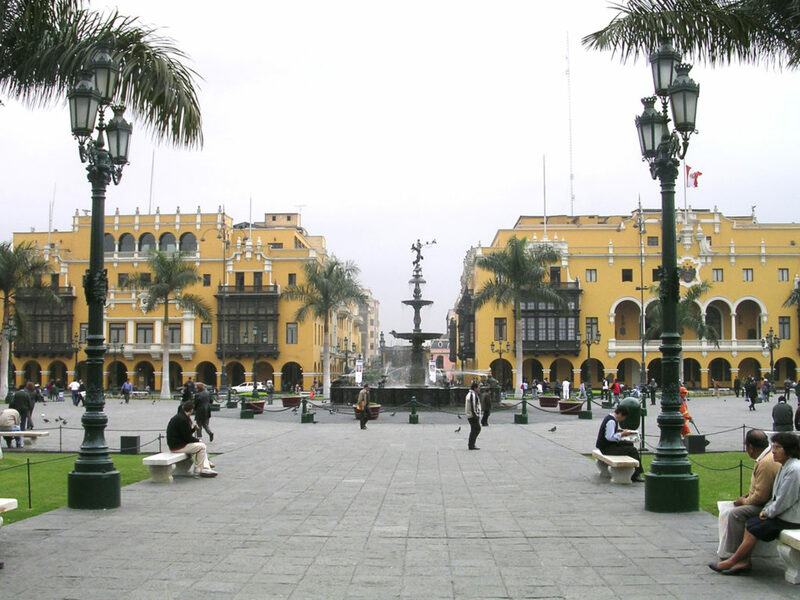 The historic center of Lima, location of the COP20 negotiations. Photo courtesy of Dozenist via Wikimedia Commons. Ahead of these talks, we have every reason to be concerned about the effect of climate change on our planet. Cities that are hit by extreme heat and drought are facing extreme flooding or snowfall in the same calendar year. It is happening everywhere, more frequently, and in a more severe fashion. The latest scientific reports demonstrate that we have already filled up more than two thirds of the global carbon budget of our atmosphere. If we are serious in preventing irreversible climatic changes in our planet, this result presents us a huge global challenge: keeping the rest of the oil, coal and gas in the ground, rapidly accelerating our shift to a circular economy supported with 100% renewable energy and increasing forest stocks, not tomorrow but today! But for those who believe in the collective power of humanity, the game is not over. 2014 will be remembered as one of history’s turning points. On 21 September, we witnessed the largest global civil society movement, gathering millions of citizens including mayors, ministers and CEOs, ahead of the unprecedented multilateral collaborations at the Climate Summit 2014, hosted by the UN Secretary-General. More countries are announcing unconditional pledges, including a commitment to bring forward their peak emissions; new money is being poured into global funds; and investments in renewable energies are exceeding those in fossil fuels. It is now clear that the new global climate regime is a race to the top; every positive contribution to the new global climate regime is an integral part of the race. The question is: how fast can we accelerate these efforts? This is where we must acknowledge the vast, untapped potential in the ambitious commitments and mobilization power of local and subnational governments for mitigation and adaptation action. Indeed, global climate advocacy on behalf of local and subnational governments has been one of the most consistent and persistent efforts to keep the light of hope burning. In 2010 in Mexico City, at a time when no one could see how to move beyond the Copenhagen failure, mayors all around the world launched the Global Cities Covenant on Climate – the Mexico City Pact. In 2011 in Durban, following the adoption of the Durban Adaptation Charter, we called on nations to urbanize the climate agenda. In May 2012, at the first ADP Workshop in Bonn, we announced that the time had come to engage with local and subnational governments. In 2013 in Warsaw, the first Ministerial-Mayoral dialogues were convened at the historic Cities Day. In June 2014 in Bonn, we had nine hours of positive dialogue with national delegations and experts on how to scale up actions at the local and subnational level. At the Climate Summit 2014, the Compact of Mayors was launched, with the most ambitious and largest coalition to date, designating the carbonn Climate Registry as its central repository. This groundbreaking registry already captures impressive climate information from some 500 local and subnational governments, which serve more than 12% of the world´s urban population. All these are now part of the global efforts as well. The first COP decisions to recognize the role of local and subnational governments as governmental stakeholders were adopted in Cancun in 2010 and in Warsaw in 2013. The current text proposed by ADP Co-Chairs includes a strong vision to empower cities and subnational authorities, enabling them to take more ambitious commitments and actions. It is time now for the COP20 in Lima to connect all these dots as a part of the new climate package, so that in Paris in December 2015, we can kick off a decade of transformative actions to ensure low-carbon, low-emission, climate-resilient development in the urban world of the twenty-first century. In order to facilitate these efforts, ICLEI will once again lead the Local Government Climate Roadmap delegations in Lima, with representatives from all around the world, including Belo Horizonte, Bogota, Brussels, Durban, Nantes, Paris, Recife, Seoul, Tokyo and Tshwane. We will present updates on our efforts, including the launch of the Global Protocol for Community-Scale GHG Emissions. And we look forward to providing substantial contributions to the Lima Action Agenda of the Peruvian Presidency. For more information on the Lima Dialogues, please visit our splash page!